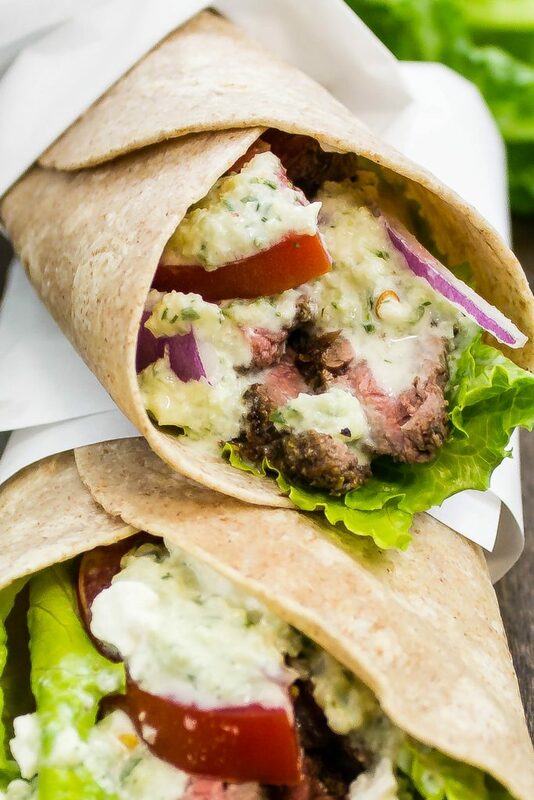 Steak Gyro Wraps are seasoned grilled steak topped with tzatziki sauce, tomato, onion, lettuce, & feta cheese all wrapped up in a whole wheat wrap. Weight Watchers friendly recipe- 5 SmartPoints! I am a huge fan of Greek food. The spices, the sauces, the ingredients… it’s a great combination of flavor. When I am in the mood for Greek food but don’t want to spend money eating out, I make it at home! 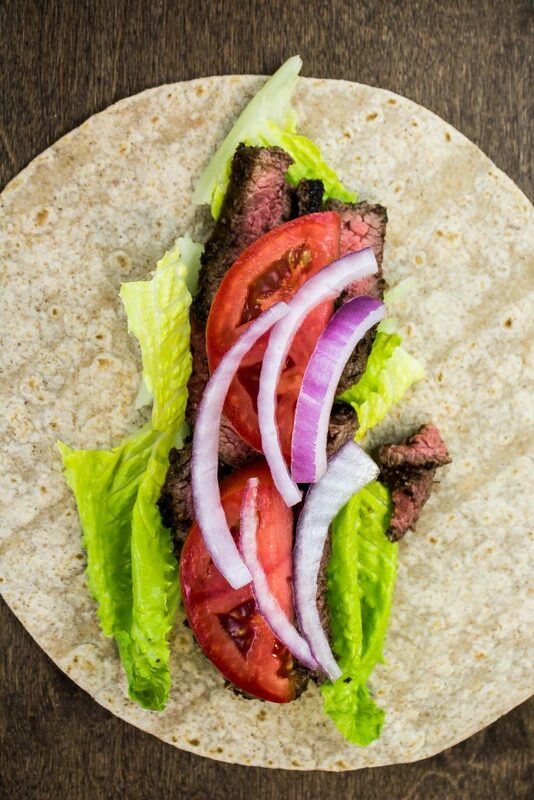 My Steak Gyro Wraps are a healthy twist on the classic gyro. 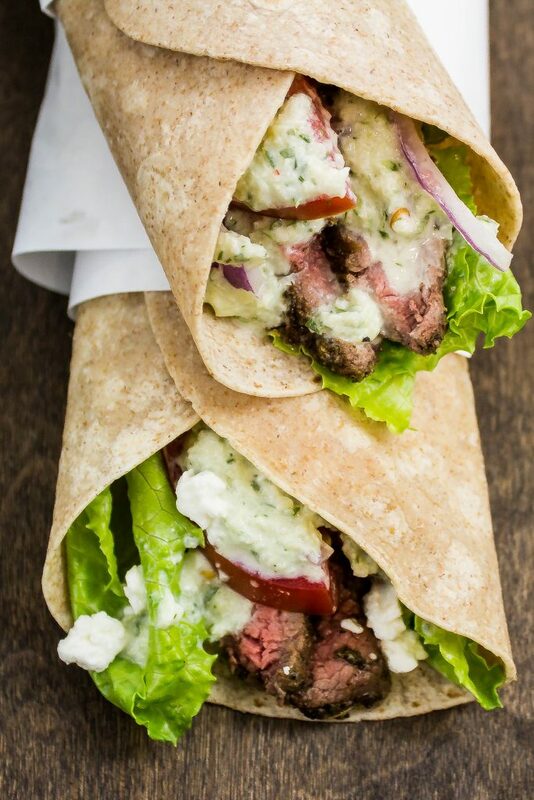 Seasoned steak grilled to perfection topped with homemade creamy tzatziki sauce, tomato, onion, lettuce, and feta cheese all wrapped up in a whole wheat wrap. 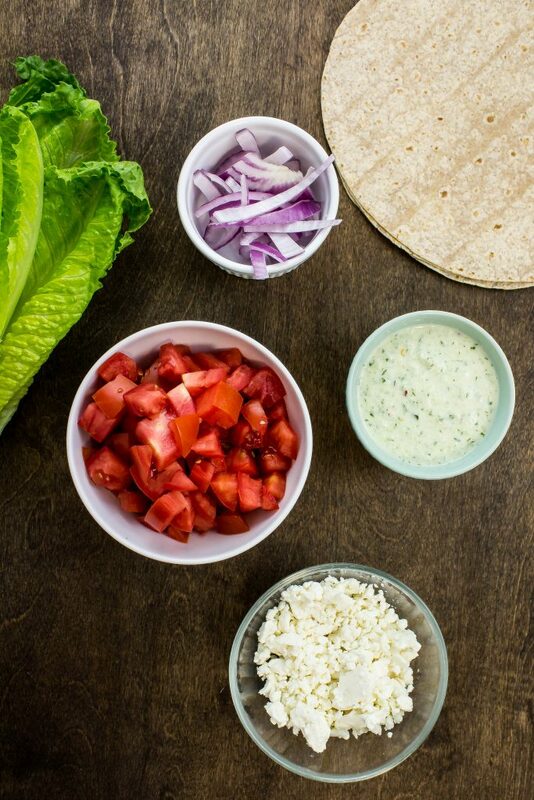 This is a Weight Watchers friendly recipe and each wrap is 5 SmartPoints. I never really tried Greek food until about 5 years ago when I worked close to a Greek restaurant back in Austin. When I walked into the place, the smell was heavenly and the food looked unreal. Since I didn’t really know what Greek food was, I asked my friend to suggest an item for me to order; their suggestion was a Gyro. Have you ever had a Gyro before? It’s seasoned, grilled lamb and beef topped with lettuce tomato, creamy tzatziki sauce, and feta cheese wrapped up in a warm pita bread. It’s beyond delicious! I live in Indianapolis now and there are a ton of delicious Greek/Mediterranean restaurants close to me. Anytime I venture out to one of these restaurants, I always order the gyro. Sometimes a chicken gyro, a falafel gyro, or the classic lamb/beef gyro. I try to save the eating out for the weekend, when I’m using my extra Weight Watchers weekly points. When I’m craving a gyro during the week, I make a healthier version at home. 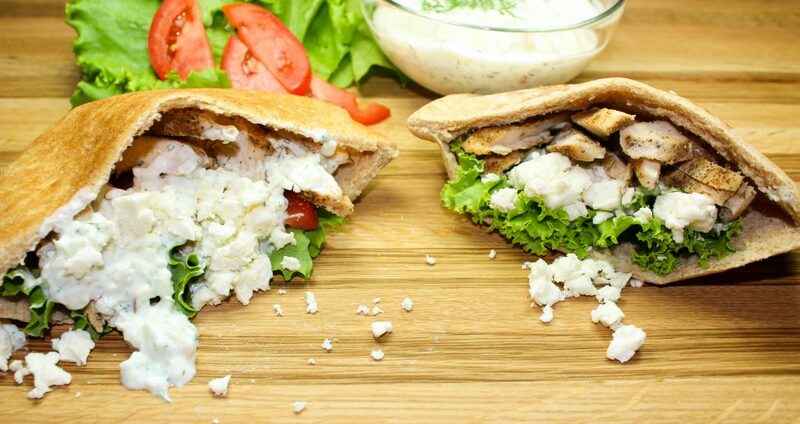 A while back, I shared my chicken version of a gyro: Healthy Chicken Gyros. Seasoned chicken breast, lettuce, tomato, feta cheese, and Homemade Tzatziki Sauce stuffed into a whole wheat pita pocket. THEY ARE DELICIOUS! I love to make the chicken ahead of time on Sunday then have the meat ready for lunch during the week. My husband prefers steak over chicken so a few months ago when I was craving a gyro (again) I decided to make steak gyro instead of chicken. What’s great about this recipe is that all the work can be done ahead of time! I like to grill the steak, make the tzatziki sauce, and prep the veggies on Sunday that way I have all the ingredients ready to go during the week to make the wraps for lunch. 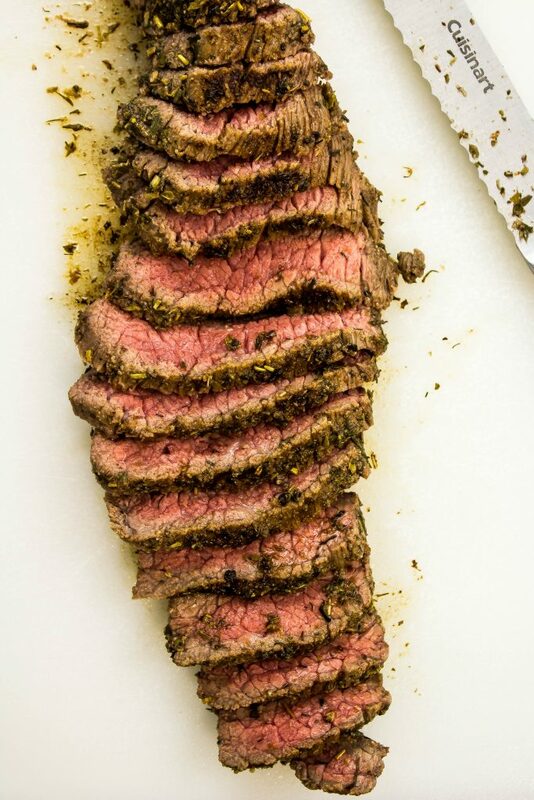 For the steak, I use top sirloin, but you can use any kind of steak. 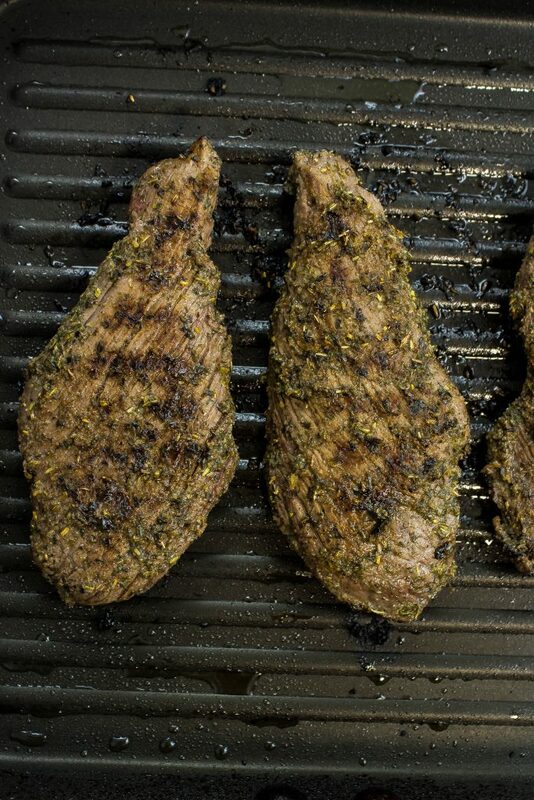 What makes the steak so delicious is letting the steak marinade in the spices before you grill. 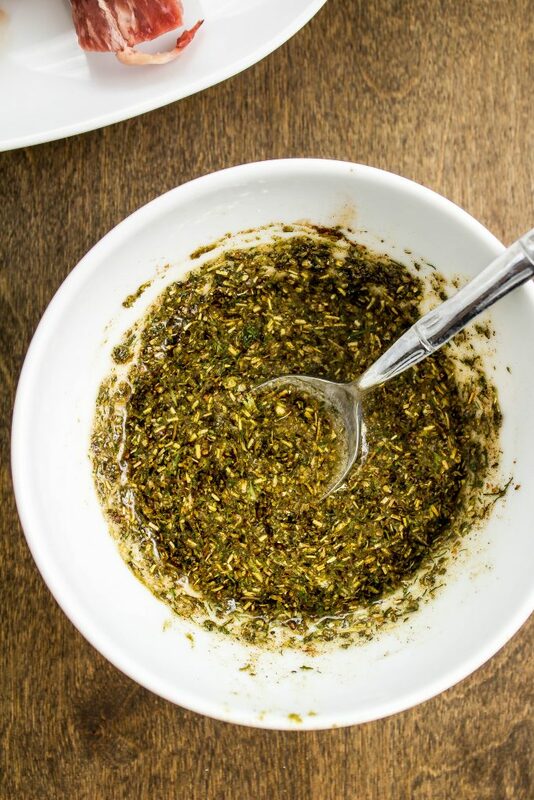 The marinade is a mixture of garlic powder, onion powder, dried oregano, dried basil, dried dill, dried parsley, dried rosemary, dried thyme, pepper, cinnamon, nutmeg, olive oil, red wine vinegar, and lemon juice. 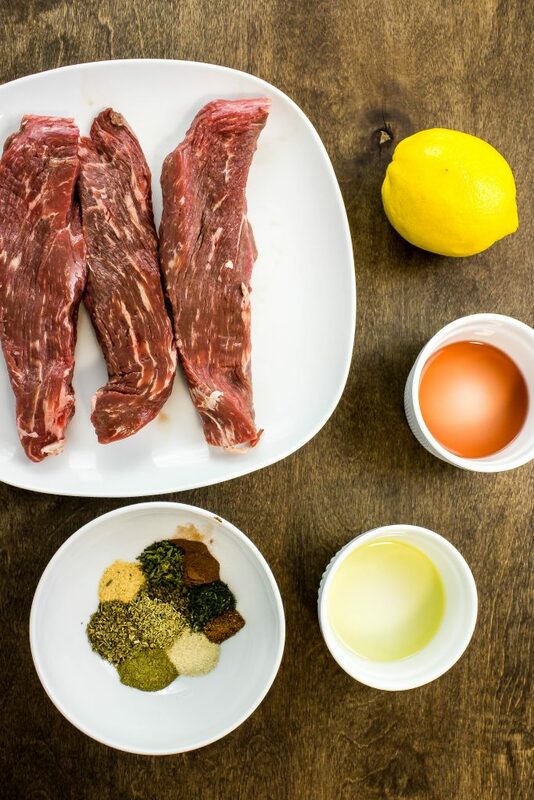 Mix the marinade ingredients together then add the marinade and steak to a ziplock bag. Shake the bag to ensure the steak is coated and marinade in the refrigerator for at least 1 hour. 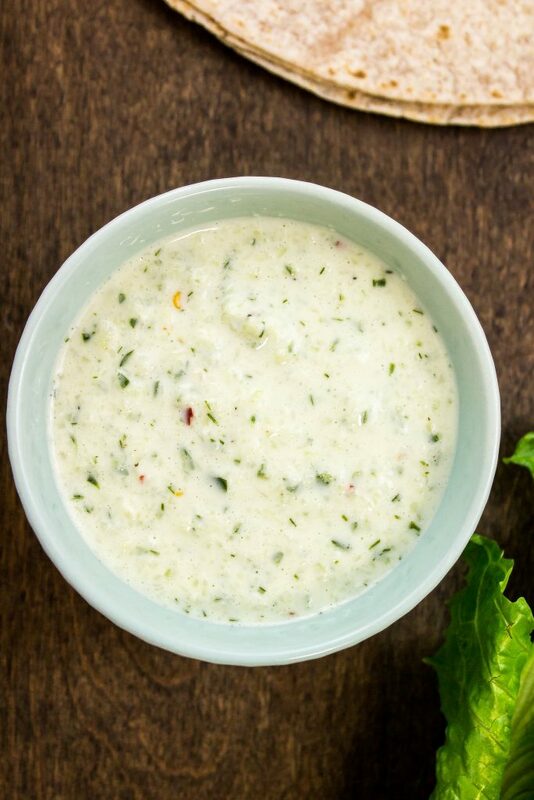 While the steak is marinating, make the Homemade Tzatziki Sauce. 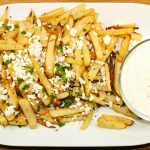 This sauce is a MUST for these gyros and will stay fresh for up to 5 days in the refrigerator. Heat an indoor grill pan over medium high heat and brush with olive oil. Grill the steak for 10 minutes, flipping half way through. Let the steak rest for 10 minutes before slicing. Slice the steak into thin strips. If you prefer your steak to be well done, just heat up a small skillet over medium heat then add a few of the steak strips to the skillet. Cook for a few minutes until the steak is cooked to your preference. My husband prefers medium and I prefer well done. I always cook a few of the steak strips in a skillet for myself 🙂 . 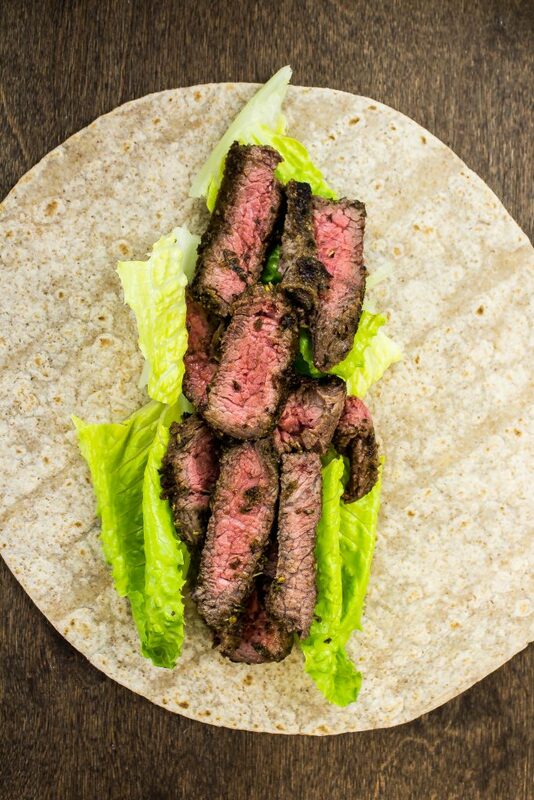 Once the steak is sliced, it’s time to assemble the wraps with the steak and all the filling! Lay a whole wheat tortilla wrap on a flat surface. 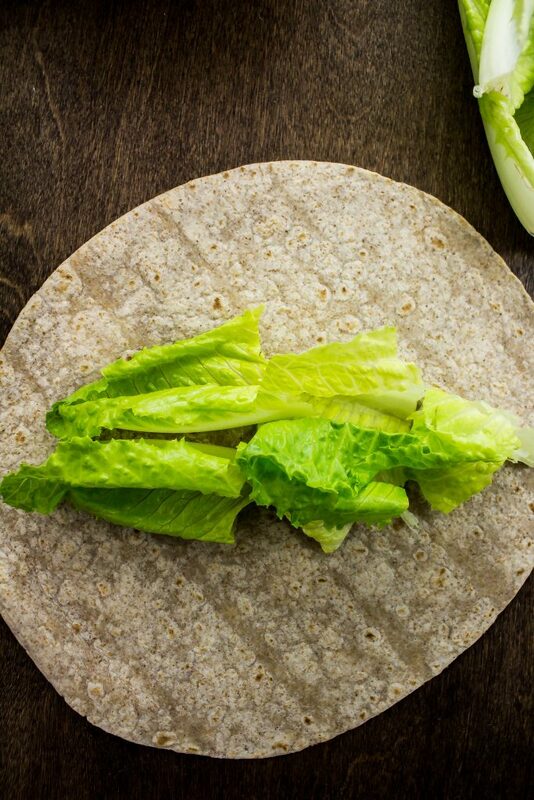 Next, add a few pieces of romaine lettuce to the tortilla. Add the grilled steak strips. Add diced roma tomatoes and sliced red onion. Top with Homemade Tzatziki Sauce and feta cheese. 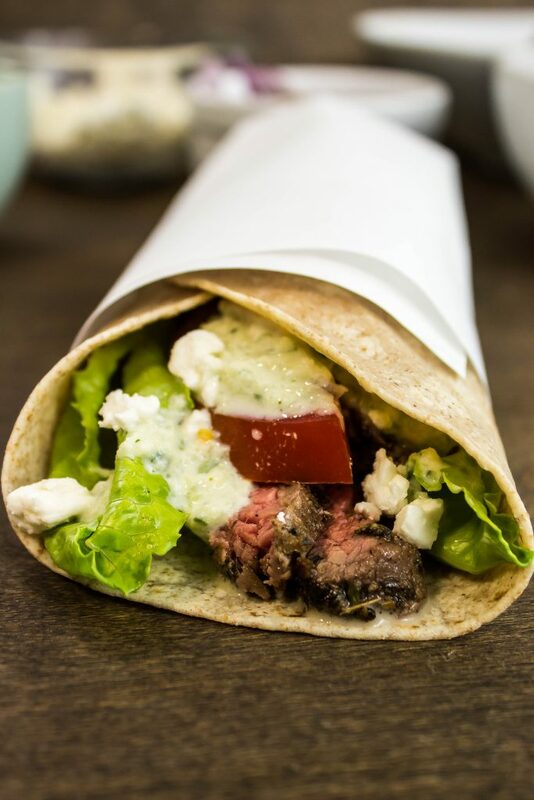 Wrap it up and enjoy delicious Greek food made at home! 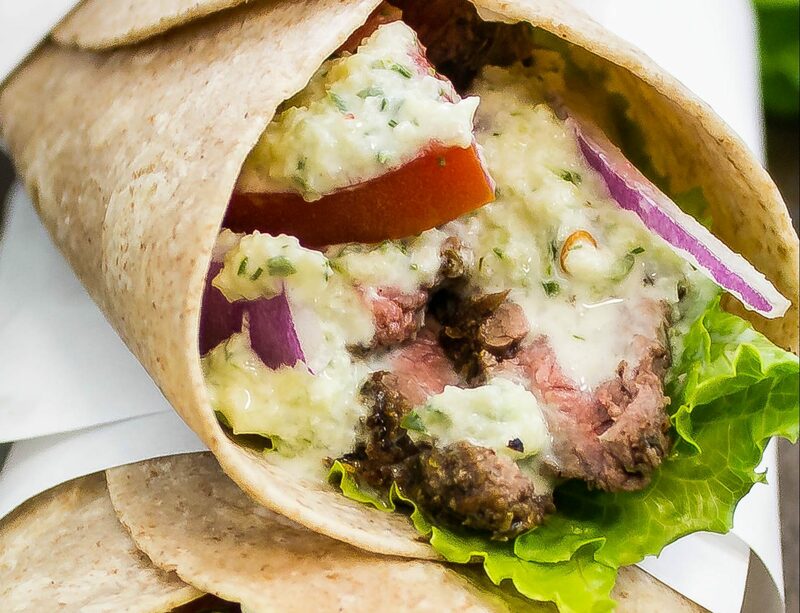 Steak Gyro Wraps are a healthy twist on the classic gyro. 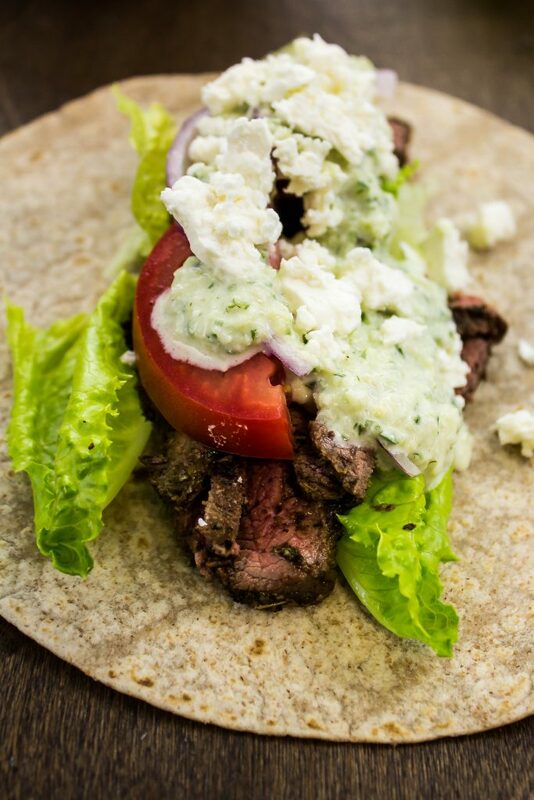 Seasoned steak grilled to perfection topped with homemade creamy tzatziki sauce, tomato, onion, lettuce, and feta cheese all wrapped up in a whole wheat wrap. Save the money and make Greek food at home! Grill the steak and prep all the other ingredients on Sunday so you can have a quick weekday lunch ready to eat! 5 Weight Watchers SmartPoints for one wrap. In a small bowl, mix Greek seasoning, red wine vinegar, lemon juice, and olive oil. 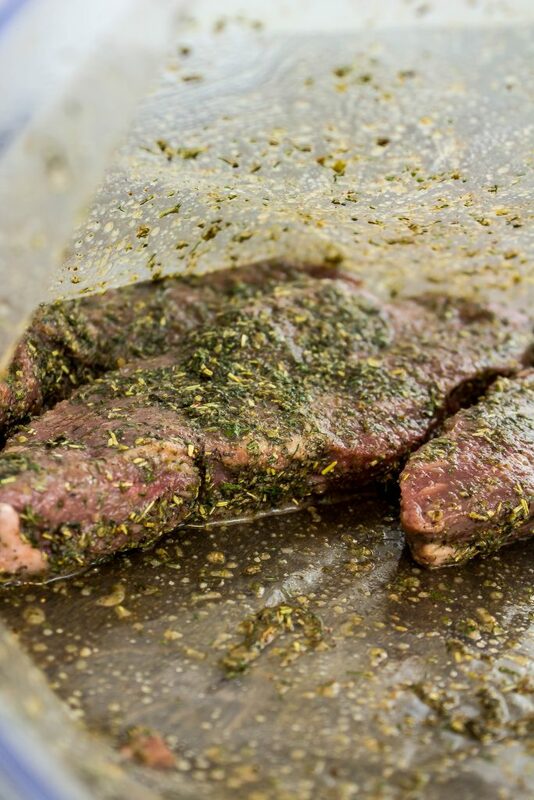 Add seasoning along with steak to a large zip lock bag and shake to coat steak. Let marinade for 1 hour. Heat cast iron grill (or grill pan) over medium high heat and brush with olive oil. Add steak and cook for 10 minutes, flipping half way through, until cooked medium rare. 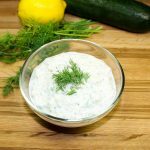 Make Homemade Tzatziki Sauce according to recipe instructions. Lay whole wheat wrap on a flat surface. Add romaine lettuce, steak strips, diced roma tomatoes, sliced red onion, feta cheese (optional), and 1 tablespoon Homemade Tzatziki Sauce. If you prefer your steak to be well done, just heat up a small skillet over medium heat and add a few of the steak strips to the skillet. Cook for a few minutes until the steak is cooked to your preference. Feta cheese not included in nutrition or Weight Watchers SmartPoints calculation. September 8, 2017 at 10:57 am These sound, and look, so delicious! I'll have to make these for my fiance, he loves gyros! September 11, 2017 at 10:35 am Oh, he will love you even more for making these :)!! September 8, 2017 at 11:11 am These are perfect for a weeknight dinner! Can't wait to try these! September 11, 2017 at 10:35 am They ARE perfect for a weeknight dinner... and great for lunch the next day :)! 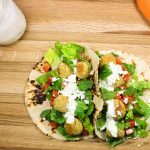 September 8, 2017 at 11:35 am Just over the past couple years have a fallen in love with gyro wraps! I never thought about making them myself. Thanks for inspiring me! September 11, 2017 at 10:34 am You gotta try these Emma!! 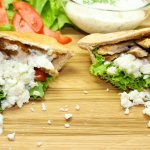 September 8, 2017 at 12:45 pm Love gyros and am happy to find a healthier WW friendly version! September 8, 2017 at 9:18 pm I love everything about this recipe! I am definitely putting this on my grocery-list. September 9, 2017 at 11:22 am Yum! These look delicious, I may just make them for dinner tonight. The marinade looks/sounds so fresh and flavorful! September 9, 2017 at 12:45 pm Delicious! These look like a great meal! Both the chicken and steak sound amazing! September 11, 2017 at 10:32 am This is totally why I love wraps too Ana! Thanks!! September 11, 2017 at 10:32 am Yes! Super easy to make Sarah!! September 10, 2017 at 2:49 pm This looks fantastic and super easy! Thanks! September 11, 2017 at 1:39 pm HOMER SIMPSON DROOL ALERT! Gyros are one of my favorite indulgences. Seriously, these wraps look mouth watering! I can't WAIT to make these! September 13, 2017 at 12:00 pm I'm drooling too Christina! !